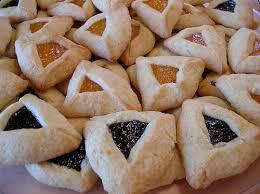 I saw on my calendar that Purim begins Wednesday so I thought it would be fun to make hamantashen. Many years ago when I was living in Brooklyn I went to a Purim dinner that my Jewish friends were having. I don’t recall what we had to eat for the dinner part but I do remember three things – that we had some great wine, we ate hamantashen and we had a lot of fun! So in fond memory of the great times I had with my friends during my Brooklyn salad days I will be making poppyseed, raspberry and apricot hamantashen. I miss you Nathaniel and Rebecca!